King Abdullah II and Queen Rania of Jordan arrived in New York for a working visit. Yesterday, Queen Rania met with US-based supporters of the Jordan River Foundation during the UN General Assembly week in New York. Then, Queen Rania met with representatives of US and international Jewish organisations. An advocate and a humanitarian, Queen Rania serves as an Eminent Advocate for UNICEF and Honorary Chairperson for the United Nations Girls' Education Initiative (UNGEI). The Jordan River Foundation is Queen Rania’s NGO that focuses on the disadvantaged in Jordan. As far as I know she never repeats an outfit. There maybe one or two exceptions that she really really likes. I have been thinking of the same thing. Just out of curiosity, is this country, Jordan, rich or wealthy? The GDP per capita is only $5,292. Interesting! No we are a poor country, or that what they want us to believe!!!!!! Is she sitting next to Soros??! It's not about Fashion anymore. So many Royals are in N.Y.. 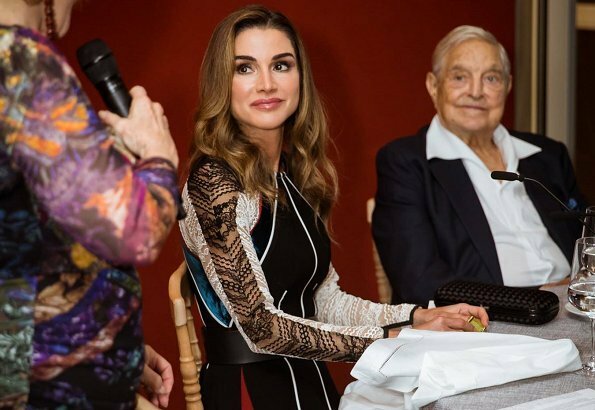 I hope she feels comfy next to Mr. Soros. I'm out. Interesting design on the dress, at least it is not the ugly floral that so many European royals have been wearing. It would be better with plain sleeves. I agree, with plain sleeves, it would have been fantastic. Once again a total miss. She is a beautiful Lady why is she doing this to herself. TEGENWOORDIG IS ZE VEEL VRESELIJK GEKLEED. I like the dress and she is very fit, which makes a difference. I actually think she does re-wear outfits. Probably less than she should. The funds come from the Royal family, as I understand it, not public funding. She has made such a difference to women in her country, in many ways than one. Both she and the king are highly respected (in particular by comparison to other leaders in the area). Not an easy thing to accomplish. I have read somewhere, a couple of years ago, that she is very criticized as a BIG spender for her wardrobe, accessories etc. Her clothes must be very fashionable but somehow I never understand them, maybe it is cultural thing. This one looks just weird, mongrel of sweatpants, tights and dress.